In ZF Sachs' variable damping system, sensors for acceleration, displacement and steering help an electronic control unit choose a damping level for the suspension. Continuous damping control is an electronic system that can adjust the tension in a shock absorber to create a more dynamic ride for the vehicle. Delphi Corp. uses a special fluid that can be made syrupy or like water depending on an electrical charge. Other suppliers use electronics to vary the valves that control fluid flow within the shock continuously. Both systems let the shocks adjust to road input for maximum stability, handling and comfort. 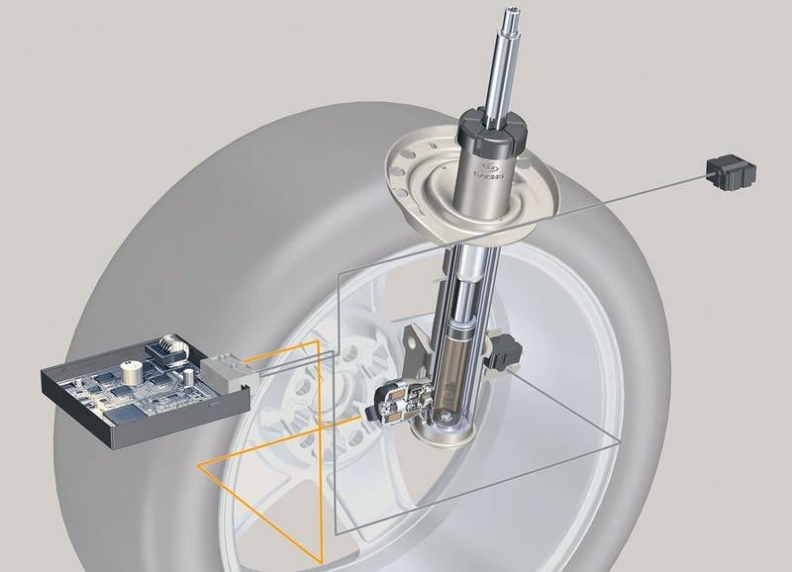 The latest systems can adjust a vehicle's suspension as frequently as 1,000 times a second. This technology is seen mainly in high-end cars and sports cars, but that is starting to change. "Now it's moving into medium-class cars," said Thomas Kutsche, head of development of variable damping systems at ZF Sachs. Delphi's system, which is called MagneRide, uses magneto-rheological fluid, which surges through special orifices to dampen axle motion. When an electromagnetic coil inside the damper's piston is activated, the fluid's components align differently, rendering it thicker or thinner as needed. A computer controls the coil to provide fast reaction to road conditions based on input from sensors that monitor body and wheel motions. Others, including ZF Sachs, use a valve-control mechanism for damping. Continuous valve control uses a combination of acceleration, displacement and steering sensors to help an electronic control unit choose a damping level for the suspension. An electronic valve on each shock or strut reacts to the computer commands by restricting or enlarging the channel that oil flows through. MagneRide is used on the Cadillac DTS, Chevrolet Corvette and Buick Lucerne. Tenneco Automotive Inc. supplies Volvo models, and ZF Sachs supplies the Opel/Vauxhall Astra in Europe, plus a number of high-end models such as the Porsche Cayenne, Volkswagen Touareg, Audi A8 and BMW 7 series. This technology is moving more slowly into mass-market vehicles than others such as tire-pressure monitoring and electronic stability control because it offers fewer clear-cut benefits to the consumer. The main issues are cost and maintenance. Shocks are a high-wear item, which means replacement could be expensive. Delphi, Tenneco Automotive, ZF Sachs, Continental Teves and most other shock absorber makers.